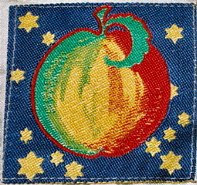 In September 1967 while filming Magical Mystery Tour, The Beatles decided to open a fashion boutique as the first venture in their newly founded Apple Corps empire. Their accountants had already acquired a piece of real estate at 94 Baker Street in London's W1 as a long-term investment and so they decided to give the "Fool" £100,000 to design and stock the new Apple Boutique in the premises. 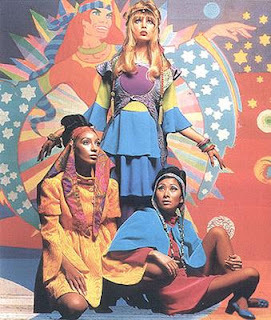 The Fool began by engaging a group of art students to help them paint a huge psychedelic mural that they had designed across the while exterior of the store, and were instantly met with complaints from other merchants in the area. The interior of the store itself was being organised by The Beatles so every morning Paul McCartney would turn up to ask the workmen to literally move the walls around, and John Lennon would turn up every afternoon and demand they be put back. John Lennon's childhood friend Pete Shotton had been managing a supermarket that John had purchased and was brought in to manage the store, helped by George Harrison's sister-in-law and sometime model Jennie Boyd whose presence seemed to attract more stares than purchases. When additional staff were aquired they fitted the shop's strange atmosphere perfectly. 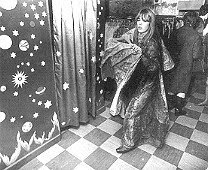 One was a self-styled mystic named Caleb who slept underneath a showcase during his breaks, and the other was a larger than life lady who floated around the store in authentic gypsy costume. The first business problem Pete Shotton came across occured before the stock had even been created. Cutting rooms had been established above the shop where tailors could begin turning thousands of pounds worth of fabric into Fool creations. Amongst the orders for vast bolts of raw silk and lush velvets The Fool had ordered multi coloured silk labels for all their designs which resulted in the label often costing more to produce than the clothes could eventually be sold for. Pete tried to bring this problem to his friend Lennon's attention and was told "Oh, let them do what they want. We're not business freaks, we're artists... if we don't make and money, what does it matter?" The opening night party was held in the first week of December 1967, attended by John Lennon and George Harrison. Celebrity friends such as Cilla Black were handed apple juice as they walked in and entertained with a fashion show and a variety of circus acts. The Apple Boutique like many other Apple ventures that followed was a financial disaster and closed after eight months. The trinkets stocked in the shop were of the sort people could already buy in various shops throughout London, much of the fashion seemed to be in the style that everyone had worn last Summer and the huge changing rooms were perfect for shoplifters. The shop hadn't even been open two months before it's manager Pete Shotton quit. "It was total madness! I had four bosses for a start, all giving different orders. Paul would come in and tell me where he wanted a partition. Almost as soon as we had done it, John would arrive and say, 'what the ****'s going on here?' He'd then want the partition taken down. There was so much back-stabbing and status seeking as Apple took on more and more people, often just because they'd met in a club or a gallery. Then there were the suits, pushing around their bits of paper, sending memos. Most of them didn't have a clue. I'd come from running a little supermarket to find I was supposed to organise something which was taking on the size and complexity of ICI. 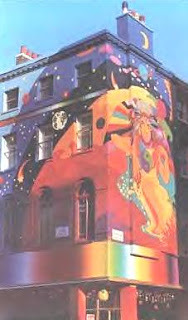 The Beatles wanted the shop to be a beautiful place where beautiful could buy beautiful things. They also wanted everything to be for sale. So if a customer fancied a light fitting or a display case, that was for sale as well. Imagine trying to stock for that! The boutique originally gave every indication of being a success, but the trouble was that so much of the stock seemed to disappear from the premises without the benefit of a cash transaction. Our turned-on, tuned-in staff were not only loathed to apprehend shoplifters, for fear of appearing un-hip, they also felt no scruples about helping themselves to goods which happened to take their fancy." The boutique had managed to loose The Beatles nearly £200,000 in only seven months, and was still loosing money after the new manager John Lyndon took over and threatened to ban The Fool from the premises if they removed any more stock or charged any more debts to Apple. The bold psychedelic mural proclaiming the Beatles' presence on the street had disappeared in May after the Civic Association had begun proceedings to have it removed. The shop was now a stark white with tiny writing above the windows nonchalantly declaring you were at Apple, and the flat atmosphere inside the shop seemed to match it perfectly. On the morning of 30th July 1968 the staff were told to open the doors the following day and give the stock and fabrics away, prompting John and Yoko to turn up that night and be the first to raid the place. Staff stood by and watched in amazement as Yoko marched into the cutting rooms to collect large swatches of fabric which she laid on the floor, piled high with merchandise and then dragged into the back of John's Rolls Royce. Paul arrived later and found a jacket that he liked but Ringo went away decalring that he couldn't find anything that fitted him. The giveaway had been publicised via the newspapers and the television and when the doors opened there was a queue of scavengers three blocks long. It was decided to open the basement doors to allow the crowds to walk through the store and right out the other side. The Beatles had ordered that no limit be put on the amount of stock people could take, and after armfulls of clothing and uncut fabrics disappeared out of the doors, coat hangers and shop fittings began to disappear. No-one was stopped until the moment when one woman began trying to prise the carpet up off the floor. Paul declared in an interview that "We decided to close down our Baker Street shop yesterday and instead of putting up a sign saying, 'Business will be resumed as soon as possible', and then auction off the goods, we decided to give them away. The shops were doing fine and making a nice profit on turnover. So far, the biggest loss is in giving the things away, but we did that deliberately. We're giving them away - rather than selling them to barrow boys - because we wanted to give rather than sell. Originally, the shops were intended to be something else, but they just became like all the boutiques in London. They just weren't our thingy. The staff will get three weeks' pay but if they wish they'll be absorbed into the rest of Apple. Everyone will be cared for." The final disaster that the boutique was involved in took place a week after the shop had closed down. Paul McCartney and his live-in girlfriend Francie Schwartz decided to publicise the new Beatles single by writing it's name on the whitewashed shopfront. The single was a double A-side, prompting they to scrawl "Hey Jude" and "Revolution" in huge letters across the store, and resulting in a backlash from the local Jewish community who felt threatened by the words. Paul's dream of "a beautiful place where you could buy beautiful things." was well and truly over. Beatlegirls advertising Apple Boutique designs. 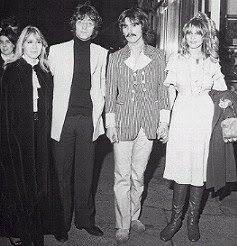 Top left: George's wife Pattie in blue satin shirt and red satin pantaloons. 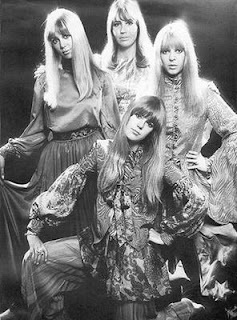 Back centre: John's wife Cynthia in pink-purple chiffon dress with a lurex tunic and mauve stockings. Back right: Ringo's wife Maureen in apple green jacket embroidered in gold, over night blue baggy pants appliqué with yellow stars. Front: George's sister-in-law Jenny in print trimmed jacket, gathered skirt and chiffon trousers.